In recent years, developed countries have formulated public policies in agriculture ranging from supporting rural life and farm income to promoting sustainability of food and fibre production. Public Policy in Agriculture: Impact on Labor Supply and Household Income addresses the lack of empirical research in this area. It explores the impact of differing approaches to public policy through a series of international case studies, from the USA and Canada to South Korea, Norway, Slovenia and Taiwan. At a time when much of the developed world has been experiencing budget deficits and policy-makers and the public in general have re-opened the debate on public expenditures in the agricultural sector, this is a timely volume. 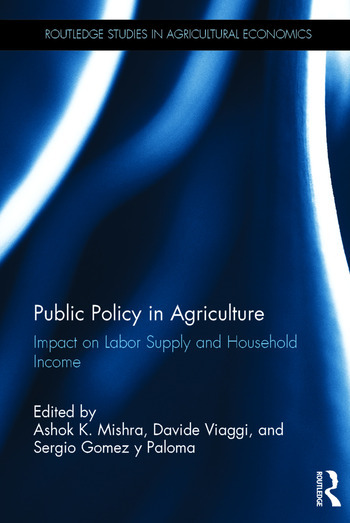 Mishra, Viaggi and Gomez y Paloma have written an authoritative guide to agricultural public policy that will serve as a reference for academics, researchers, students, and policy-makers. Households Associated with Agricultural Holdings: Selected Socio-Economic Dimensions…………………………………………………………………. The Effects of U.S. Agricultural Policies on Farm Household Income and Labor………………………………………………………………………..
Part-time Farms in Canada: Changing Concepts and Changing Policy……. Farm Household Incomes in OECD Member Countries over the Last 30 Years of Public Support……………………………………………………………………..
Farm labour and farm income: Case Study from Norway………….……. Contribution of Public Policies to Farm Real Estate Values………….……. Land Markets in Europe: Institutions and Market Outcomes ………….……. Does the Elderly Farmer Pension Program Affect the Off-farm Labor Decisions of Younger Adults in Family Farms in Taiwan?……………………………. Ashok K. Mishra is Kemper and Ethel Marley Foundation Chair in the Morrison School of Agribusiness at the WP Carey School of Business, Arizona State University, Tempe, USA. Davide Viaggi is Associate Professor at the Department of Agricultural Sciences of the University of Bologna, Italy. Sergio Gomez y Paloma is senior researcher and scientific officer at the Joint Research Centre-Institute for Prospective Technological Studies (JRC-IPTS), European Commission, Sevilla, Spain.